Up for review today is the newest from Montecristo (Altadis)—the Montecristo Nicaragua Series. The cigar was originally released in 2018, and we had the luck of hosting the New York launch of that event at The Carnegie Club (more about that event here). If “Nicaragua Series” sounds familiar, there’s a reason for it. Many traditionally DR-focused brands have released “Nicaragua” blends in the last couple of years, including Davidoff, Aging Room, Romeo y Julieta, H. Upmann, and a slew of others. It’s a transparent attempt to capitalize on Nicaragua’s growing reputation as the new epicenter of flavor and quality in the cigar world. Not all attempts have been successful (I don’t care for the Davidoff Nicaragua, for example), but I appreciate all of the attempts. Mainly because I love Nicaraguan tobacco. Let’s see how this cigar smokes. I’ve got to say, looking at the Montecristo Nicaragua Series, it’s definitely a step above many of the previous Montecristo USA blends in terms of how it’s branded. Instead of being a bit gaudy as other blends like the Espada Guard or the Pilotico which has a massive mid-cigar band, it’s got striking but conservative black, gold and red branding. It gives the cigar a sturdy look, makes it stand out, all without calling to much attention to itself. So props to the Montecristo branding team on this one. The outer Eucadorian Habano wrapper is nearly seamless, with just a few small veins and an otherwise flawless appearance. When squeezed, the cigar has a fair amount of give and seems to be packed consistently the length of the cigar. Off of the foot is a nice array of aromas: where spice is the first aroma to meet the nose, it is followed by sweet cedar, hay, and salt and pepper and coffee. Nothing remarkable, but well balanced. The cold draw is a bit less expressive, but generally mirrors the aromas off of the foot. The Montecristo Nicaragua Series opens with medium-plus bodied smoke. It’s got a lot of what I expect from Montecristo: earth, almonds, and cedar balanced by some creaminess. There’s also a bit of chocolate which edges in on the nose. Smoke production is a touch above average, meaning I’m not having to work too hard to product smoke and I’m getting the flavors as intended. The retrohale is a bit unwieldy, with a bit too much earth which compromises the smoothness of the smoke. First impression: this is similar to Montecristo’s other core products, but with additional heft from the Nicaraguan tobaccos. It’s actually quite complex, with the earth being the only note that sometimes dominates too much. At an inch in, the Montecristo Nicaragua Series has a razor sharp burn that’s still holding strong. I’m finding at this point that my favorite part of this smoke is actually the aroma. The scents are sweet but complex, with notes of almonds, floral and light milk chocolate. The almond note on the palate is fully in charge, though a rough textured earth elbows out many of the more subtle notes (cocoa, cedar, and baking spices). Translation: good complexity, but could use a bit more balance. This continues up until a few puffs into the second third, where the Montecristo Nicaragua Series Robusto begins to come more into focus and more into balance. The heavy earth and spice on the retrohale mellows a bit, and the impressions on the palate are balanced between bitter, sweet, and spicy. The flavors themselves haven’t moved much, but the increased balance amplifies the enjoyment of the smoke. In the final third, the Montecristo Nicaragua Series edges above medium in terms of body and strength. Sweetened almonds, cedar and burnt espresso are center stage, with baking spices and salt on the tip of tongue. It’s a pleasant enough profile, but it’s clear at this point that the cigar could benefit from more movements in flavor. Thankfully, the cigar manages to avoid the burst of harshness at the end that many fall prey to, providing for a nice close to the experience. 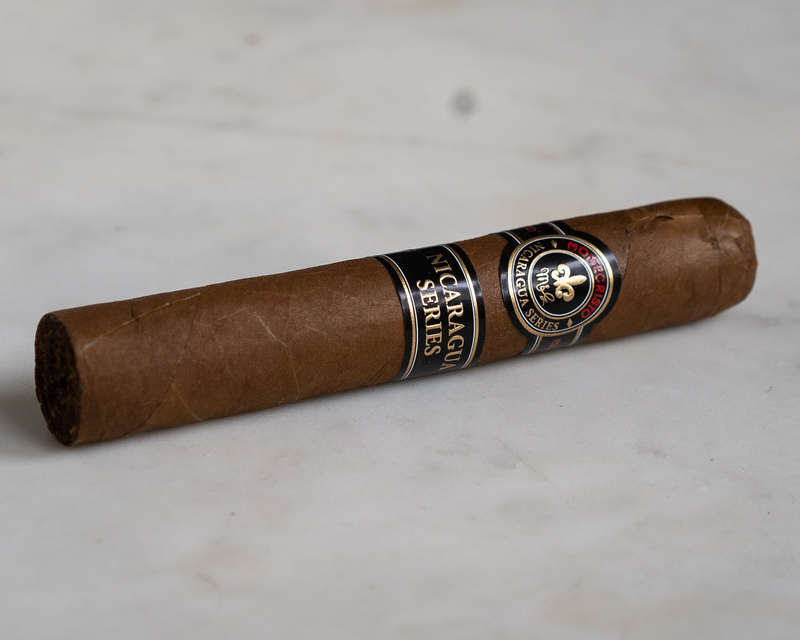 While the Montecristo Nicaragua Series doesn’t fly high in terms of balance, it does offer a nice take on the more traditional profiles of Dominican Montecristo cigars. It’s also a lot more elegant of a cigar than many other Nicaraguan blends that focus exclusively on producing high powered smokes. That being said, I’m still very particular to other Montecristo blends like the Espada, New York Series, and others.